Raisebook has secured a very small allocation of the in demand IPO of Tando Resources. We are accepting bids of $2,000 per entity only. If you wish to bid with multiple entities, please email info@raisebook.com after you submitted your first bid and we will see what we can do. Please be aware that making a bid does not necessarily guarantee we can accept it. Bids are due by 6PM AEDT / 3PM AWST. Offer Type: Initial Public Offering (“IPO” or “Offer”) to raise $4.5 million. Please ensure you refer to the prospectus in full if you are interesting in investing, this can be accessed by clicking through on this page. Tando Resources Limited (“Tando”) is a junior exploration company with a conditional right to acquire one mineral exploration project located in Western Australia, the Quartz Bore Project. Tando has also made two applications for exploration projects in Western Australia, the Mt Sydney Project and Mt Vernon Project. Tando was established with the purpose of exploring and developing zinc, lead, copper and other mineral opportunities. Value entry point - Low entry point with EV of ~$1.3m. Proven location – projects are located in a proven Zinc & Copper area currently seeing exploration activity. Specific base metal leverage - Leverage to Zinc & Copper via asset portfolio. Active post-market news flow - Near-term drilling activity targeting Zinc & Copper at the Quartz Bore project to drive news flow program. Balanced board - Strong technical and capital markets experience. The Quartz Bore Project is located within the West Pilbara province, 80 km east of Roebourne in Western Australia. The Project covers an area of approximately 15km2 and includes identified copper, zinc and lead occurrences. Exploration within the Project area commenced with the discovery of the Salt Creek volcanogenic massive sulfide deposit in the mid 1970’s. Work has included aeromagnetic surveys, geological mapping, regional scale auger, rotary air blast drilling, ground electromagnetic conductivity mapping, air core drilling, reverse circulation and diamond drilling of advanced targets. The numerous exploration works and drilling has identified notable mineralisation, including copper, zinc and lead, at prospects within the Quartz Bore Project. Balla Balla Prospect: was discovered in June 2008 via reverse circulation drilling. 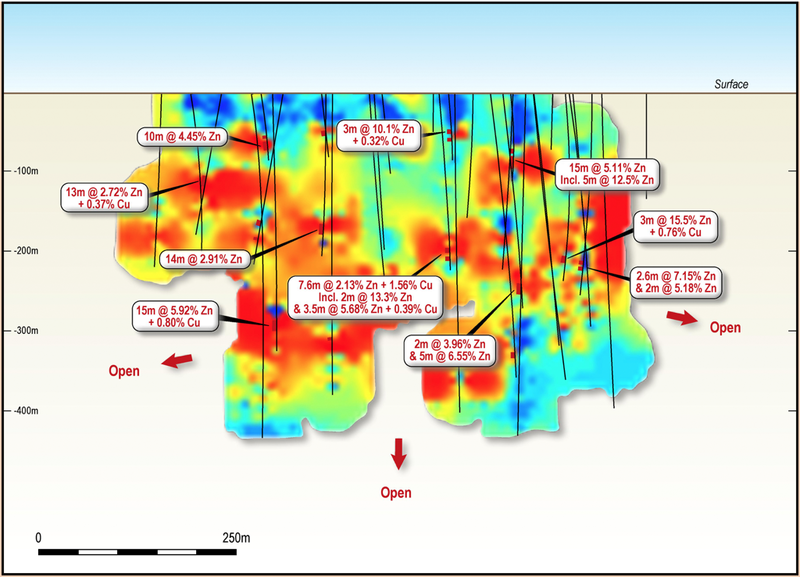 It is contained within a similar stratigraphic sequence to the zinc mineralisation at the adjacent Salt Creek Project (held by Venturex Resources). It is hosted within metasedimentary volcaniclastic and epiclastic lithologies within the Cistern Formation, with the footwall rocks deformed in excess of the ore sequence and hanging wall. East Balla Balla prospect: is located approximately 1km to the east of the Balla Balla volcanogenic massive sulfide mineralisation. It is located within an area of flat alluvial sediments with sparse and discontinuous outcrop. The prospect was identified in 2007 by rock chip sampling, returning an 18% copper result from an outcrop of massive chalcocite in a small gossan and 570ppm Zn and >1% Pb. West Balla Balla Prospect: The prospect is a sediment hosted stratabound massive sulphide body, hosted on the northern flank of the Caines Well Batholith within a relatively thin sequence of the metasediments cistern formation). The West Balla Balla prospect is considered to be a volcanogenic massive sulfide style of mineralisation based on its presence within metasedimentary volcaniclastic and epiclastic rocks within a bimodal volcanic sequence in which rhyolite is the footwall to the deposit. It has a strike length of 800m, defined by drilling and VTEM. Mt Sydney Project is located within the East Pilbara province, approximately 300 km southeast of Port Hedland in Western Australia. The Project comprises a single exploration license application which covers an area of approximately 508km2 and is prospective for copper, zinc and lead mineralisation. To the north of the Mt Sydney Project is the Braeside Zn-Pb-Ag mining district which includes the Ragged Hills mining centre and numerous small mines located along the Braeside Fault zone. The Braeside Fault zone contains high grade polymetallic mineralisation over 30 km of strike with dominant galena and associated sphalerite and chalcopyrite. Recent work by Rumble Resources (ASX.RTR) has re-evaluated the potential of the Ragged Hills mining camp to the north of the Mt Sydney Project and proposed the hypothesis that the mineralistion at these prospects may represent a volcanogenic massive sulfide system. The Mt Vernon Project is located in the southwestern portion of the Pilbara region, approximately 130 km south of Paraburdoo in Western Australia. The Project comprises a single exploration license application which covers an area of approximately 463 km2 and includes copper, zinc and lead deposits. The project area spans a wide cross-section of the Edmund and Collier Groups of the Bangemall Supergroup. These sedimentary rocks include numerous occurrences of base metal mineralisation including variations of sediment hosted zinc–lead–silver mineralisation, and structurally controlled copper–zinc mineralisation. Granting of native title clearance. Quart Bore Zinc & Copper drilling and results. Leverage to news flow post listing. Company specific risks include: Limited history; Restricted securities reducing liquidity; and Quart Bore Project held on trust. Industry specific risks: Tenure, access and grant of applications; Exploration & operating; Exploration costs; Operating & development risks; Zinc, Copper & base metal volatility and FX rate; Resource, reserve & exploration targets; Failure to satisfy expenditure commitments; Mine development; Equipment & availability; Exploration & mining titles; Environmental; Environmental health & safety matter; and Native title & aboriginal heritage. The Shares the subject of this Prospectus should be considered highly speculative. Investing in exploration companies carries unique risks that need to be considered in full, we urge you to read the Prospectus in its entirety and seek professional advice if required. For further details on risks including general risks please refer to the Tando Resources Limited Prospectus, available to download by clicking through on this page. Jeremy King is a corporate advisor with over 15 years’ experience in domestic and international legal and corporate matters. He spent several years in London where he worked with Allen & Overy LLP and has extensive corporate experience, particularly in relation to corporate issuers in respect of various debt and equity capital raisings. Bill Oliver is a geologist with 18 years’ experience in the resources industry working for both major and junior companies. Bill has led large scale resource definition projects in the Pilbara for Rio Tinto, managed exploration in Portugal for Iberian Resources Limited, including target generation and grassroots exploration across a range of commodities, and worked in near mine exploration/resource definition roles. Patrick Burke has extensive legal and corporate advisory experience and over the last 10 years has acted as a Director for a number of ASX, NASDAQ and AIM listed companies. His legal expertise is in corporate, commercial and securities law in particular capital raisings and mergers and acquisitions.